New biofuel production concepts focus on decentralized small-scale biomass conversion units and on integration with fossil refineries. Hydrogen from electrolysis can significantly enhance the utilization of biogenic carbon in synthesis gas processes. 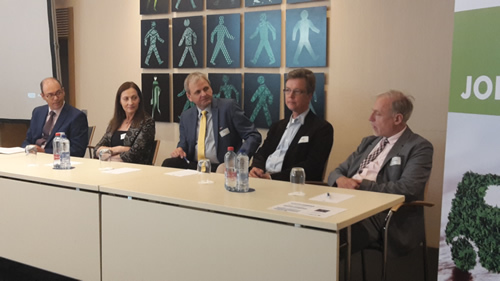 On June 4th, 2018, more than 20 biofuels experts gathered in Brussels to discuss biofuel technologies at low TRL (Technology Readiness Level). Presentations elaborated on the status of research and demonstration of various biofuel technologies. Focus was on decentral biomass conversion units at a scale compatible with regional biomass supply, and on integration with fossil refineries, either by adding bio-oil to the Fluid Catalytic Cracker (FCC) or by upgrading raw FT (Fischer-Tropsch) products into advanced biofuels. Hydrogen from electrolysis is increasingly included in conversion processes to enhance the utilization of biogenic carbon, but can also be produced from biomass through a chemical looping technology. The Fuel Cell and Hydrogen joint undertaking (FCH JU) is financially supporting related projects. The workshop started with an introduction to the European Technology and Innovation Platform Bioenergy (ETIP Bioenergy). Bioenergy is a central part in a future low carbon society. Research and innovation support and political framework have to go hand in hand to commercialize biofuel and bioenergy technologies. ETIP Bioenergy is the key European forum for industry and research interested in innovative biofuels and bioenergy. Ingo Ball, WIP Renewable Energies, reported on the BABET-REAL5 project which aims to develop a concept for the implementation of small-scale lignocellulosic-based ethanol production facilities in rural areas. As to bring the investment costs down, commercially available equipment is used for the biomass pre-treatment: a twin screw that is already being used for pet food production. Biomass shall be procured from a catchment area of only 50 km radius, targeting at obtaining 30,000 tons per year of dry biomass. The analysis shows that quite a number of regions in Europe and Latin America has sufficient potential of agricultural or forest residues to support such a concept. The envisaged biomass pre-treatment and ethanol fermentation technology will be demonstrated within the project. Walter Wukowits, TU Vienna, presented the Waste2Fuels project which aims to establish bio-butanol from waste streams as a sustainable alternative fuel. Potato peel, apple pomace, brewers´ spent grain and coffee silverskin were tested for their suitability for fermentation to butanol. A continuous ABE fermentation cascade of 4 reactors is used to produce acetone, butanol and ethanol, with in situ product recovery to enhance conversion efficiency. Three different methods are being tested for product recovery: pervaporation, adsorption and gas stripping. After separate testing of the fermentation and the product recovery, the process steps will be coupled later in the project. Tijs Lammens, BTG Bioliquids, explained how co-processing of pyrolysis oil in fossil oil refineries can lead to partly biogenic fuels without major effects on refinery product yields. The production of pyrolysis oil is already being demonstrated at commercial scale in Hengelo, Netherlands, where the fast pyrolysis bio-oil (FPBO) is currently being used for heat and electricity production. This FPBO could be upgraded in the fluid catalytic cracking (FCC) unit of refineries. To match scale, the concept foresees the utilization of 5-10 % of bio-oil from several pyrolysis facilities to be processed together with the raw oil that goes into the FCC unit. The biogenic carbon becomes part of all refinery products, including gasoline and diesel. Retrofitting existing FCC units can be done at low capital cost, resulting in a relatively low production cost of the resulting partly biogenic fuels. Pasi Kauppinen, VTT Technical Research Centre of Finland, presented the COMSYN project which aims for a small-scale gasification-based concept which would allow reduction of the biofuel production cost of 35%, resulting in less than 0.80 €/l production for diesel. Modifications from earlier concepts include the use of steam for the gasifier, high temperature filtration operated at gasifier outlet temperature, adjustment of H2/CO ratio in the reformer without the need for a separate water-gas-shifting unit, sulfur removal with a combination of activated carbon and ZnO-based sorbents, and an intensified FT-synthesis with cobalt catalyst that allows for 10-15% of inert gases. Several process steps are being tested at lab scale, while others are pilot scale. The concept foresees upgrading of the FT products into advanced biofuels at a fossil refinery. Rikard Gebart, Lulea University of Technology, reported on the modification of the Chemrec gasification and methanol/DME production technology to use hydrogen and oxygen from the electrolysis of water. The base process was demonstrated in 2011 and included the gasification of black liquor from a pulp mill in an oxygen blown gasifier, gas clean-up and synthesis to methanol and DME. The modification includes an electrolyser that is sized to supply the oxygen for the gasifier; the hydrogen produced is sufficient to adjust the H2/CO ratio for the subsequent methanol synthesis without the need for a separate water-gas-shift unit. Feedstock under consideration is a mixture of black liquor and pyrolysis oil at roughly even shares. In the base case (without addition of hydrogen from the electrolyser) only half of the biogenic carbon ends up in the product; by adding hydrogen almost all biogenic carbon ends up in the methanol. Christian Aichernig, REPOTEC, presented a concept for the integration of gasification and FT synthesis with an electrolyser. This concept was developed and tested in the Winddiesel project. A conventional steam-blown dual fluidized bed gasifier (as applied e.g. in the GoBiGas project in Gothenburg) with subsequent gas cleaning and FT synthesis and product separation is modified by adding an electrolyser and a CO2 separation unit; also the FT unit has to be enlarged by 70%. In the process CO2 is separated from the syngas and used as gasification agent instead of steam; hydrogen from the electrolyser is added to the raw syngas to adjust the H2/CO ratio. As a result around 75% more FT products are produced, significantly increasing the carbon efficiency. Plans exist to demonstrate this technology at a scale of 50 MW biomass and 33 MW wind power input; assuming 50% investment funding the demonstration facility would be economically feasible. Viktor Hacker, Graz University of Technology, presented a chemical looping concept for the decentralized production of hydrogen from biomass syngas. While fluidized-bed chemical looping with metal oxide is state of the art for heat generation, application of the concept in fixed-bed reactors for the production of hydrogen is at TRL 2-4. The concept includes operating a fixed-bed reactor containing a reactive oxygen carrier material in two alternating phases. In the first phase syngas is passed through the reactor, oxygen is released from the carrier material and CO2 and H2O are produced. In the second phase steam is passed through the reactor, oxygen is bound to the carrier material and high purity, pressurized H2 is produced. The process has been tested at lab scale. Further research currently focuses on improving the lifetime of the metal oxide. 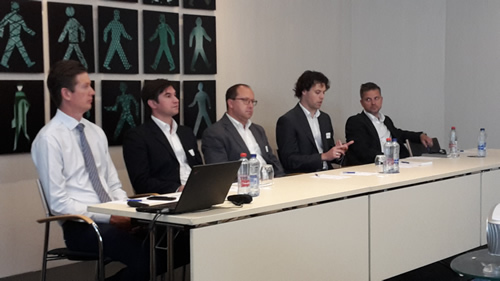 Nikolaos Lymperopoulos, Fuel Cells and Hydrogen Joint Undertaking (FCH JU), presented a number of projects that the FCH JU is supporting in an effort to develop technologies to provide green hydrogen for decarbonising the industry and transport sectors. The FCH JU is a strong public-private-partnership focused on bringing fuel cell and hydrogen technologies to the point of market readiness by 2020. So far, 227 projects have been supported with 844 million €. One of these projects is the H2Future project that focuses on producing green hydrogen from hydro power and using it in the steel industry. Another project aims to green the refining industry by displacing 1% of a refinery´s hydrogen consumption with electrolysis-derived hydrogen. The FCH JU publishes calls for research and demonstration proposals once a year in January with a deadline for submission of proposals in April. The topics of the calls are proposed and selected by the European Commission and European Industry, the latter represented by Hydrogen Europe. Maria Georgiadou, European Commission, DG RTD, concluded the workshop by presenting the framework and relevant calls for public funding of research and innovation projects on biofuels and bioenergy. The major instruments are the Horizon 2020 research and innovation framework programme, the Innovfin EDP facility, and the NER Innovation Fund, both of the latter for investments into first-of-a-kind projects. Maria also presented the key messages derived from the recent “Horizon 2020 Workshop on Bioenergy, Advanced Biofuels and Renewable Fuels”. Tijs Lammens, BTG Bioliquids B.V.